From a rare beef sandwich that brings memories of yesterday’s roast flooding back to a slice of cold pizza, picked out of the box amidst the empty beer cans and overflowing ashtrays, leftovers can be a culinary experience worth savouring. Not to mention a winning hangover cure. As a result, most nights I try and cook a little too much for dinner. Lunch often consists of a bowl of reheated pasta, liberally dosed with ketchup and extra cheese or a steaming plate of freshly microwaved noodles. But, for me, it is potatoes that top the leftover tree. That hit of carbohydrate is just what I need as a late, second, breakfast or early lunch. Boil, roast or mash a few extra and your midday meal the following day is sorted: sautéed with a fried egg, dipped into pungent aioli or even squashed into cakes and fried, they are darn near perfect. 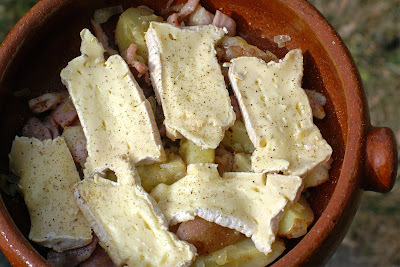 The absolute best way to use up leftover spuds, however, is to make a speedy tartiflette. Potatoes, bacon and cheese? That’s three boxes ticked and a guarantor of a very happy lunchtime indeed. Dice a few rashers of bacon and fry in a little oil. Meanwhile, finely chop a couple of shallots or a small onion. Once the bacon has started to crisp up, turn down the heat and add the onion. Fry a few more minutes until it’s softened. Add a handful of cooked potatoes to the pan and allow to heat through. If you get a few crisp edges then all the better. Top with a generous amount of soft cheese – camembert, brie, reblochon – and grill until the top of the cheese starts to bubble and the underneath has melted into a gooey sauce, slathering the bacon and potatoes in its cheesy goodness. Eat immediately. And feel no shame if you squirt some ketchup on the side, it’s not like anyone’s looking. 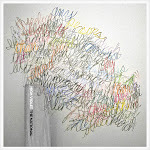 For more sundry leftovers, why not follow me on Twitter? Tartiflette is an amzingly soothing dish for those cold winter days.. especially when made this fast! I love tartiflette, I've actually only had it once because I don't trust myself not to eat the whole lot but I think about it often. That looks stunning. 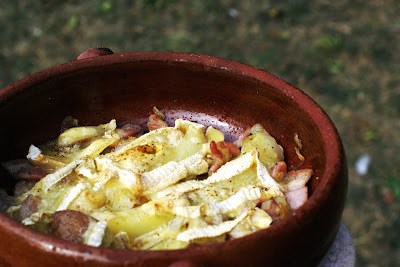 I adore tartiflette - this'll perfect as the weather changes. I always cook extra for leftovers too, but invariably end up eating it all first time round. You are a genius! Just the thing for that small serving of leftover potato lurking in my fridge. I'm a big believer in making large dinners and having leftovers for lunch. My absolute favorite is to make huge pots of curry and then dig in when I get hungry. Nice to know there's something good to eat around. 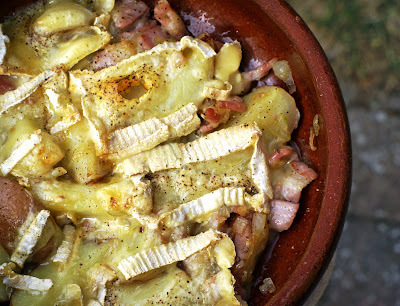 10 minute tartiflette definitely sounds like a winner! I'm going to have to give it a try. Alex, very concerned with your cavalier useage of ketchup in your leftover meals. Are you serious? Oh yum! I've never had a leftover potato in the house, so I'm not sure I will ever be cooking this, but I'd like to! love it! no recipe required! I've never heard of Tartiflette. That looks like an easy and satisfying lunch plus it looks really delicious! Chcocolate Shavings - It's ideal winter fodder, that's for sure. Ollie - I often have the same problem! Hopie - Well with you on the curry front. It's very satisfying to know you can sneak into the kitchen at any time and grab a plate of something tasty.